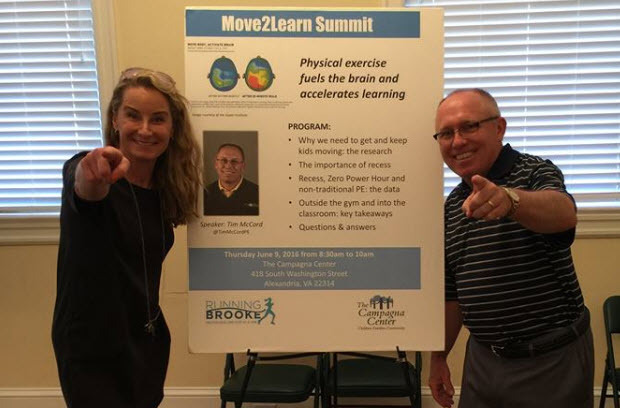 At the conclusion of the 2016 Move2Learn Summit, Tim McCord was kind enough to take the time to provide written responses to questions from Summit attendees. The first step is to be open and honest about what you are trying to accomplish. Keep the administration in the loop at all times as you implement your program. Let the administration know of any setbacks and how you plan to rectify them as well as any positive outcomes. Advocacy and education are the keys. Start out by educating those who need to know. Bombard those people with the pertinent information to your cause. Be personable and take every opportunity to talk with staff and administration about your program. This can be a battle as PE has a reputation as being simply an “add on” program. There is very little respect for PE in the education world. That being said, there is no better time to integrate PE into the classroom than now (with everything being written about childhood obesity and brain research connecting physical activity and learning.) The key to making this work is to also be willing to integrate the classroom topics into PE. It’s the old “one hand washes the other” adage. Advocate, advocate and then advocate some more. I started by making sure my principal, superintendent and school board all knew about the changes we were making in our PE program. From there, I then educated the community as a whole by using the media as our means of getting the message out. Every chance I had to speak to the decision makers in our school system…I took the opportunity. I showed them my passion and dedication by working as hard as humanly possible. This is an excellent question. Children, as well as adults, are resistant to change. I think the teacher has to show his/her passion for their subject matter in order for the students to become excited. The teacher also has to take away the fear of trying something new. In our PE classes we began the usage of technology (heart rate monitors) that made it possible for all students to succeed. Students were graded based on effort and no longer on athletic ability. As a result, all students had the ability to be successful and therefore were more willing to try new activities. Resistance will still be met but the teacher must continue to strive for that comfort level that students desire that will enable them to try out new activities. Any dual language learners we had were helped by the child specific aide the school provided. As for ECE teachers…this must be a collaborative effort between the classroom teacher and the physical educator. Both must communicate both verbally and maybe even more importantly through documents making sure each know what the other is doing. A roadblock results when there is no certified physical educator in the building to assist in this process. In this case I would contact SHAPE America (shapeamerica.org) for resources. As we all know, nutrition is also important when discussing and working with children. It is important that we educate the whole child. A healthy breakfast is critical to the start of every child’s day. That being said, I would look to the website nutrition.gov for resources. The answer to the final part of this question goes back to the answers to some other questions…become a huge advocate for healthy eating. Brain boosts can be implemented at any age level as was evidenced by my talk. We had a wide age range and I was able to take periodic breaks away from my speech to boost your brain by doing simple physical activities. In addition, all college professors review their material with their students. What better way than to integrate physical activity into the review of material. My #1 tip would be to invite those skeptics into your class and let them see first-hand how your introduction of physical activity into your lessons and classroom are working. I would also designate student leaders to talk with these people who will learn first-hand from them how well this works. I don’t particularly know about improving advocacy. I just know that it is never ending. Talk the talk and walk the walk. Be prepared to spread the message at any chance or opportunity. Be prepared to give an “elevator speech” whenever the chance arises. Here is an example of an “elevator speech” that I would give if the occasion presented itself: As a 34 year career Physical Educator, it was my job to get kids moving and to expose them to as many activities as possible in the hope that they may find activities they like to remain active for a lifetime. But my job extended far beyond the gymnasium. Research today tells us that healthy, active kids learn better. As a result I believe it is my calling to make sure that not only are my students active but I also must make sure that I spread the word of why physical activity is important. Physical activity not only helps fight obesity, it also gives each person the benefit of improved brain function. Aerobic physical activity helps memory function. If one were to extrapolate that idea then we can see how active children will then receive the benefits of improved learning. Dr. Charles Hillman, of the University of Illinois, has shown increased brain activity after only a 20-minute walk. Dr. John Ratey says that exercise acts like fertilizer for the brain. He says it acts like Miracle-Gro in that exercise helps each person build new brain cells. The literature is clear. Not only does physical activity and exercise help learning, it also keeps us healthy and does not take away from learning in schools. In fact, exercise, physical activity and physical fitness are beneficial to each and every student.